On another note, if anyone would like to be a team leader, please let me know. We have removed people who have done absolutely nothing in the round so far. If you are one of those people and wish to return (and participate) feel free to let us know. Round 10 starts on Monday, so members cuts have been made. If you are not on the list below and you'd like to stay, please let me know. Past members may also ask to rejoin us here, just let me know which team you'd like. Cut! Cut! Look At Them Members! I'm about to officially make cuts to the community, if you're not on the list below and you'd like to stay please let me know. Past members may also ask to rejoin us here, just let me know which team you'd like. You may have to wait a bit for Team Regina, however. It's never too late to rejoin us, so if you do get cut, you can still re-apply or simply comment below, either is fine :) New round April 11! LAST CALL! CHECK THE LIST! I'm about to officially make cuts to the community, if you're not on the list below and you'd like to stay please let me know. Past members may also ask to rejoin us here, just let me know which team you'd like. You may have to wait a bit for Team Regina, however. It's never too late to rejoin us, so if you do get cut, you can still re-apply or simply comment below, either is fine :) New round tomorrow! I've compiled a list below of the members for next round. I haven't cut anyone yet, but I will be cutting anyone who is not on this list tomorrow. So if you'd like to stay, just comment below with which team you'd like. Same for past members, if you'd like to rejoin us for the new round, comment below! I may not accept Swans until we get a few more Snowflakes, though. I just finished sorting the members for ROUND 6 and making cuts, so I just wanted to bring your attention to how the teams currently look. Thankfully Team Swan is catching up in numbers, but we need some major pimping to bring in some more Snowflakes. Feel free to use these banners I'll make some more with different characters ASAP. This post is public so 1) those who were cut can see it & 2) past members who see this may want to return (I can hope, right?). 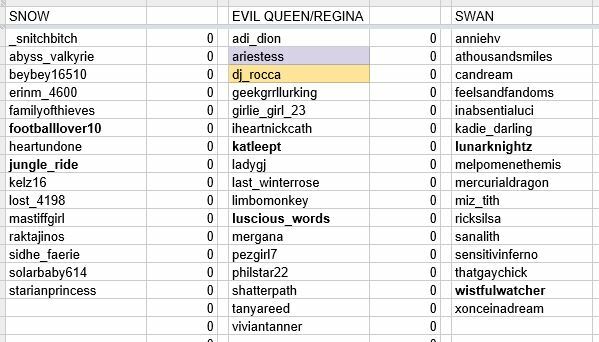 So, for those of you considering joining, I won't be accepting any new Evil Regals until the Snowflakes at least catch up to the White Knights. But if you're willing to wait for Team Evil, you just note that in your application. If your name isn't on here, but it should be just let me know down below and I'll send you the invites. If you can't see this post this post, you've been cut from the community. This includes anyone who did not answer the poll or who said they would not be staying for the next round. There were about 40 people cut. Additionally, if you opted to switch teams, you've been moved. That being said, due to the messiness of the last few weeks, I'm hoping some of you just missed the poll. So if you've been cut and you want to stay, just pop a message below. 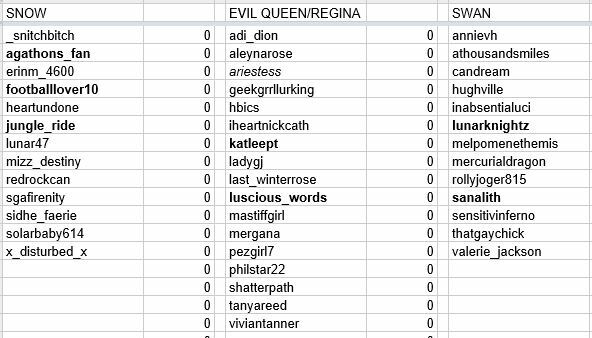 Teams Snow and Regina could especially use some members ;) Also, as far as I know, we're still looking for some team leaders for the Snowflakes, so if you're interested (or if someone already volunteered) comment below. If you'd like to help get the word out about onceuponaland feel free to use the graphics below :) Just copy/paste the stuff in the text box.